Thanks to everyone who shared their Danforth memories! With such an overwhelming response, we saved a few extras for the website. 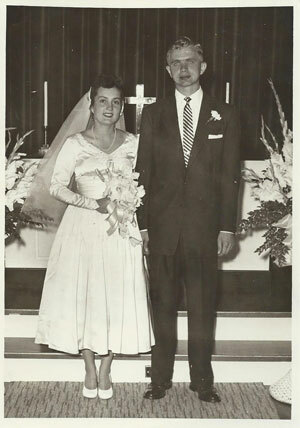 Patricia Peterson, 64BA, 70MA, and Laird Addis, 59BA, 64PhD, on Dec. 20, 1962. "We wrote our own ceremony, including poetry of Khalil Gibran, and asked the local Unitarian minister (Khoren Arisian, later the executive director of the Society for Ethical Culture) to conduct our service. He agreed, saying he would read anything we wrote—provided it contained no prayers and no vulgarities. Our wishes exactly." "Besides being alumni, both of us were longtime UI employees, Patricia as a liberal arts administrator and Laird as a philosophy professor. We are also in a select group for whom Danforth Chapel has served two generations. Our daughter, Kristin Addis, 86BA, and Nathan James Lloyd had their marriage ceremony in Danforth on June 9, 2007. Laird accompanied Kristin up the aisle as our other daughter, Karin, a professional violinist, provided the music. Kristin's grandfather conducted the service, reading what the couple had written. 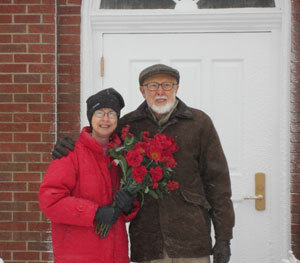 Here is a photo of us on Dec. 20, 2012, in front of the chapel on our 50th wedding anniversary." 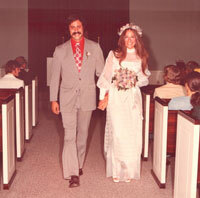 Dale Crider, 69BBA, 72JD, and Cynthia Gregory, 69BA, on June 19, 1971. "The hottest day of my life began after I asked Cyndy, my long-suffering high school sweetheart, to marry me during the 1970-71 school year. Our wedding day dawned clear and bright. By 9 o'clock, there was not a cloud in the sky and the sun's rays were beating down, while the overheated air was rising in visible waves from the pavement." "When we opened the doors to Danforth Chapel, a gush of hot air hit us in the face that nearly took our breath away. The temperature outside was well into the 90s; the temperature inside was at least 15 or 20 degrees hotter. There was no air-conditioning and opening the windows only allowed more hot air to flow through the small chapel." John Dwyer, 09BA, and Mackenzie Petty, 10BA, on June 16, 2016. "We haven't gotten married yet, but our love story is one that has University of Iowa ties throughout. Our story started back in summer 2014 when I met my soon-to-be wife at a mutual friend's going-away party. She was (and still is!) a beautiful young woman from Dubuque, Iowa, and a fundraiser for the UI Foundation. After relentless phone calls and text messages, she finally let me take her on our first date, three weeks after being introduced. I knew within an hour of that date that I was sitting across the table from my future wife." "Our first date had the picturesque summer evening backdrop of the Old Capitol Building from the patio at Basta. Soon after our first date, we were both employed by the UI Foundation as fundraising/development officers. Every day, we get to experience touching stories from alumni and grateful patients about what the UI means to them and their families. Mackenzie and I are forever grateful for the education that we received from the UI and are even more proud to fundraise for our alma mater." GeorgeAnn Evans, 94BGS, and Craig Borchardt, 84BA, on Aug. 11, 1984. "We both worked at the Iowa Memorial Union and had the ultimate IMU wedding: married at Danforth, reception in the Wheel Room downstairs along the riverside, and all of our out-of-town guests stayed at the Iowa House." "My husband worked in the graphics unit at the Union in the main business office, and I worked right across the hall in bookkeeping and accounting. He was the artist who did the original drawing of Danforth that was on the brochures at that time." Barbara Harper, 70BA, 71MA, and Loren Cohen, 69MD, 72R, 73F, 76F, on June 25, 1971..
"We met at the VA hospital where Barbara was working while getting her master's degree in library science. I was a first-year medical resident. It was love at first sight. Barbara was from Cedar Rapids and I from Waterloo. But over 44 years of marriage, we have been able to overcome our differences." Jay Cooper, 85BBA, and Melissa Affre, 87BBA, on July 9, 1988. 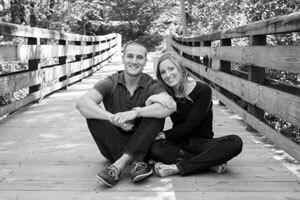 "Melissa and I met on campus during my senior year. When we decided to get married, we wanted a small ceremony and thought of Danforth Chapel as the ideal place due to its intimate size and special connection to our campus experience. Additionally, my grandmother was married in Danforth, so it had special meaning to us. Our wedding day was brutally hot with a high temperature of 95 degrees that day. The little window air conditioners could not keep up with the heat, so it was also quite hot in the chapel." "Looking back, we feel bad that our guests had to endure the terrible heat. The cold beer after the ceremony sure tasted good! During the 2008 flood, we were scared to death that Danforth Chapel would be washed away or damaged beyond repair. We were thrilled when we learned it had been spared from the devastation. Danforth Chapel will always hold a special place in our hearts, and we visit it every time we are on campus." Joan Arthur and Arno "Arnie" Jensen, 56MD, 73R, on Sept. 10, 1954. "Arno and I met during Christmas break 1950. Arnie was three years older than I and was a student at Iowa State Teachers College (ISTC) in Cedar Falls, Iowa. I was in my first semester at the UI. We had attended separate high schools, so our paths had never crossed before that night. Both of us were helping friends select Christmas trees at a tree farm across from my home. The sun was setting and the temperatures were falling. I invited Arnie and our friends to my house to get warm before making the final tree decision. I really wanted to spend more time with that handsome young man." "To make a long story short, he called me that night and we made our first date for the following night to attend an ISTC basketball game. We saw one another every day during break and kept in contact after I went back to Iowa City. The stage was set and our love story was put in motion. Arnie and I were married in Danforth Chapel on a brilliant fall day. Arnie graduated from the College of Medicine in 1956 and later was a resident in the radiology department. We have five children, 22 grandchildren, one great-grandchild, and two more joining the family this summer. Our love story keeps growing, even though Arnie passed away in 2009, just short of our 55th anniversary. I now live in Cedar Rapids." "Danforth Chapel will always have a precious place in our hearts." "We saw one another every day during break and kept in contact after I went back to Iowa City. The stage was set and our love story was put in motion." 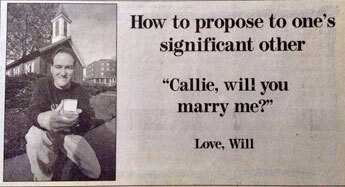 Callie Curry and Will Valet, 97BA, Danforth Daily Iowan proposal on Dec. 19, 1997. "Chris Farley almost ruined my marriage proposal. He died the day before my last college final, and I had planned on proposing to Callie through an article in the Daily Iowan, where I was working at the time. Staff photographer Justin Torner took my photo in front of Danforth Chapel, and it was to be an art element in an article about married college students." "I'd asked my roommate to grab the newspaper from our front porch early so she wouldn't see it, as I would be taking my FINAL final exam before earning my UI bachelor's degree the next day. Because of all the news about Farley's Dec. 18 death, Callie got up early to get the newspaper and she managed to spot my proposal on page two before I made it back home. She said nothing to my roommate (silently panicking and wondering aloud where the newspaper was). By the time I got home, the jig was up. I pulled the ring from my pocket to her gracious acceptance." "It still worked. Just not as planned." Joseph and Cleo Williams eloped in 1936 on the UI campus, well before the Danforth Chapel was built. They were married at the chaplain's residence and youth center by the Reverend Delmar Derks. Their first meal as husband and wife was in Iowa City at a small restaurant with hamburgers and Cokes. The Williamses had seven children. Two went on to graduate from the University of Iowa: myself (John Williams, 73BGS) and my brother, Jerry P. Williams, 62BBA. As a Hawkeye, Jerry earned academic Big Ten and all-American honors while competing on the football and track teams. Jerry and I were both lettermen on the UI track teams and had the honor of competing for the legendary UI track coach, Francis X. Cretzmeyer Jr., 36BA, 38MA. "I'm now a member of the Orange County, California, IOWA Club."